As at Eastbourne, the village of Bexhill stood inland from the sea on high ground. Its plan can still be discerned around the church of St Peter, where some old houses survive. A second church in Domesday Book is thought to have been in the hamlet of Northeye (VCH 9 p123). The bishop of Chichester held the manor, which was coterminous with the hundred of the same name, almost uninterruptedly until 1559, when it passed to the Sackville family. The hamlet of Little Common in the west of the parish was the first area away from the old centre to be built up and in 1842 a church, St Mark, was opened. Only after 1880 did the Sackvilles develop a resort near the coast. The station was already there and new houses and hotels followed. A church, St Barnabas, was opened in 1891. The northern side of the parish was then developed with new churches in Woodsgate Park (St Stephen, 1898) and Sidley (All Saints, 1909). A railway branch from Crowhurst station, to serve this area, opened as late as 1902. Bexhill was more popular as a place for retirement than as a resort and by the 1960s the proportion of over-60s was the highest in Britain. Proximity to the sea was prized, so after 1920 the town developed in both directions along the coast; eastwards to join Hastings and westwards into Cooden, where a church was opened in 1934. The C19 churches of Bexhill are less exciting than those of other Sussex resorts. The great era of church-building was over by the 1880s and, despite generous benefactors, most churches were designed by local architects or other lesser ones. 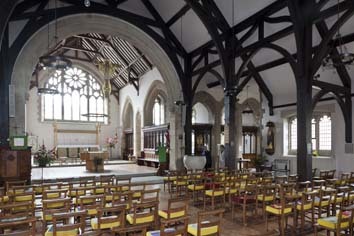 Most have remained in use, despite severe fire damage to Sir A Blomfield’s St Barnabas in 2005; only the relatively minor St Andrew, Wickham Avenue, has been closed.